Almost used the fuzzy manga circles instead of the smeary dots. AAAALLLMOOOOOST. It’s the first of her kind she’s seen since she could remember. It’s kind of sad but in another way it’s kind of cute. Hmmm… So is Sel the family name or is Kie the family name? Curse you, Agent Brown, we want answers! Neither. “Selkie” is actually a distorted child’s version of the species name … I think. The name her mother gave her was “Nei Li”. Unless Nei Li is “darling” or “sweetie” or the equivalent. I will be amused if it turns out that the correct pronunciation is Sidhe. A pity that Selkie didn’t respond to the name misunderstanding by revealing her original name (shown in a flashback, if I remember correctly). So very important to get those twenty questions done at some point. Except the correct pronunciation of Sidhe sounds more like “Shee” as in “banshee” than Sel-kie. I am working up a serious amount of dislike for Agent Brown. You aren’t the only one, Aileen. He just seams to me like a guy with a world of stress on his shoulders trying to prevent all hell breaking loose and secrets spreading that could be disastirous for selkie and others. I think he cares quite a bit, but hes stuck in the position no one wants keeping track of all this when all he really wants to do is help. My sleep-deprived and energy drink addled brain wants to think that Pohl was going to correct them and say it’s pronounced ‘Nei Li’. 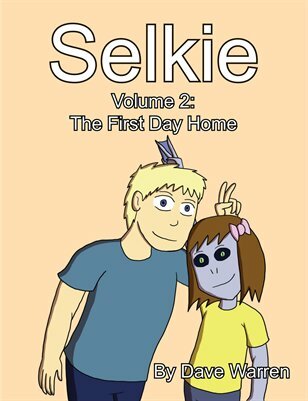 It seems to sound similar to ‘Selkie’, and he thought they were just mispronouncing the name of his species. Dammit Agent Brown, EVERYONE BUT YOU is willing to learn/give information about Selkie! Stop delaying our exposition! And upon viewing the last panel, I am struck with the sudden urge to age Selkie up to highschool and write a shojo manga about her. *Sarcasm mode*: I have absolutely NO idea how this could have happened. Anyone else imagining Todd’s head imploding? Eh? Ok, just me then. HAHAHA reverse nightengale syndrom how cute! …..I wonder if we’ll get to see an species reverse strip of this one. That would be sooo interesting! There have been a couple, one was around when Selkie was fed grapes. The reaction shot in panel 2 is priceless. And I think Agent Brown should have to wear the bunny ears now. ….oh don’t act like you didn’t see this coming. I fully expect all further portrayals of the good doctor to include massive cherry blossom falls, just fluttering down all around him. Doc Pohl is awesome. Do not extinguish his mighty epic awesomeness!!! ah the age of innocence, where lust and admiration still shows on your face. Just to be sure. Is Selkie’s “smitten” face exactly what we’re looking at (specifically what’s happening with her irises) or is this a stylistic anime style choice? Selkie’s eyes are not LITERALLY growing three sizes larger and developing glowing irises, no. It’s stylistic. Thought so but wanted to be sure. One of the challenges of having a character whose… biological traits are a plot point is making it clear when you are showing these traits and not an exageration. So while I was sure the larger eyes were a stylized anime look, the rest I briefly thought might have been caused by a nictitating membrane or something that is completely unique to Selkie’s people. It’s a comic strip. It’s stylistic and literal at the same time! How do you think cartoon characters can tell what each other are feeling? He is seriously so adorable. Interesting, doesn’t seem like he has the same speech impediment, Maybe she’ll grow out of it? We are going to get an adorable wallpaper of her smitten face, aren’t we? Are they? Didn’t notice… CRAPS! And now they’re back. Thank you. Wonder if Todd realizes (based on Selkie’s reaction to Dr. Pohl) that he’s met his future son-in-law? Pohl’s too old for her. And too married. (It was mentioned in a commentary that the male and female in the species-anatomy drawings were him and his wife.) I mean, I don’t know what the legalities of bigamy or polygamy are in their culture, and sure, we’ve seen that one polyamorous all-human quintet, but the humans at least were all the same approximate age. That may well be, but try telling that to Selkie right now. If she ever manages to get in contact with a nice older female of her species who can give her advice on stuff, it may well help with the disappointment. Personally, I like the shojou bubbles, but I think they would look really out of place with this style of drawing. The smeared dots/cherry blossoms were a good idea. Red and pink and white like yummy ground up meat … What? We’re talking about carnivores here! Also, Agent Brown, please realize that while Selkie’s grandfather may be intimidated by the implied power of your big scary government job, her family is not going to just let go of the first (presumably) reliable source of information on her biological needs, development, and birth culture. If you keep trying to enforce censorship, it’s only going to backfire as they rebel. Your best hope is to allow explainations to be exchanged, explain the reason for caution and secrecy, and strongly encourage the Smiths to keep their new knowledge within the family. Not that I’m expecting that to happen. How could stories ever have drama in them if all the characters were reasonable? Also, I can totally see Grandpa trying to force Agent Smith out of the room, thinking he’s a danger to Selkie. “Government labs,” anyone? in regards to the name…. What her mom called her could be a pet name (like little one) or a child’s name. In some Asian cultures (centuries ago I believe) a child was given a kids name, and the name would be changed slightly when they became older… names have power. so for a “magical” creature to give a true name would grant the outsider “power” over them. Thus the way Selkie pronounces her name. Or it could be that her name was Anglicized, or would that be humanized? Or, maybe the Dr and her are speaking a gender specific language or a language where certain words/phrases/pronunciations are age based. Thus his surprise that the adults pronounced the word wrong. or the two of them can be from similar, but different species. (like humans and Neanderthals). Hrm. Could it be that the name of the race is Seelie? It’s fairly close. True, but traditionally, “Seelie” is the name of a court. It’s one thing to confuse the name of your species for your own, it’s another to think you are “Senate the Hoomin” or “House of Lords the Hoomin”. At least it means that they didn’t have to determine ALL her food allergies by trial and error. One thing…I am firm about how my name is pronounced (though you wouldn’t know if you were wrong unless I corrected you). If Selkie pronounces her name “Selkie,” two syllables run together, then *that* is how her name is pronounced. How do you mispronounce Robert? Also is that heart new? I get why she likes him. He’s a Doctor!